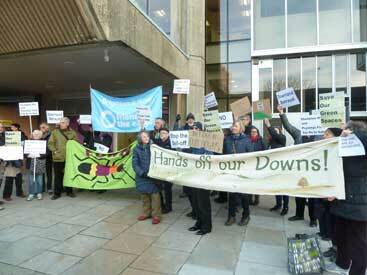 19th January 2017: Brighton & Hove residents, including some from Round Hill, expressing opposition to the officers' recommendation to Brighton and Hove City Council's Policy & Resources Committee to sell farms at Poynings and Plumpton - part of our Downland Estate. Read the case against the sales made by Friends of The Earth. Watch the Policy Resources Growth Committee meeting on webcam. An amendment was carried which will allow the proposed sales to go before  a policy review panel and  an asset management panel. The latter will free the Council Officers from leading on ways to balance the city's needs and give greater responsibility to the elected councillors.